Of all the questions astronauts are asked by kids, the most frequent one is How do you go to the toilet in space? How do you brush your hair in space? What happens when you sweat? What does food taste like? The best thing is that the answers are provided by Dr. Dave Williams, a NASA astronaut who speaks from first-hand experience. 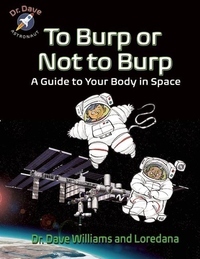 Written for kids ages 7 to 10, this book uses age-appropriate language to explain the different phenomena that astronauts encounter during a mission. The bright, colorful pages, short blocks of text accompanied by photos and humorous illustrations make this a very attractive choice for young readers. The opening message from Dr. Dave empowers kids to follow his example by believing in themselves and following their dreams.